Get fit, have fun, lose weight! Ton of Fun is Back for 2017, and you can’t miss with Fleet Feet Sport’s 4th annual Weight Loss & Wellness Challenge. This year, it’s starting January 9th and runs through February 27th. Who is this for? Anyone who needs or wants to lose weight, improve their health and do it with other members of your Aptos community. The Ton of Fun program has increased the health and wellness of over 100 people each year who have collectively lost over 2,000 pounds since Ton of Fun began. That’s over ONE TON!! Private weigh-ins at Fleet Feet Sports Aptos using our exclusive Running Affair App and our medical grade scales up to 400 lbs. This year, they are holding two sessions each day – section 1 starts is from 6:00 to 6:45, and Section 2 is from 6:45 PM to 7:30 PM (with weigh-ins starting 30 minutes prior to the beginning of the session). Due to high demand for this program and limited space, each Section is strictly limited to 60 people. – so register now! The Second Annual Run for Rio 5K Race will be held this year on Sunday, September 14, 2014. The run begins at 8:00 AM in Seascape Village, and the course winds its way through nearby neighborhoods. The fee to participate is $30 per runner or $120 for a family of up to 5. Proceeds from the run will directly benefit Rio Del Mar Elementary Parent Alliance which funds many important programs at Rio del Mar Elementary School. Seascape Village Fitness and Physical Therapy is hosting both pre- and post-run gatherings at their Fitness Center, with healthy snacks and beverages and guided warm-up and cool-down periods. Seascape Foods will also be providing a post fuel station. Got kids who love baseball? 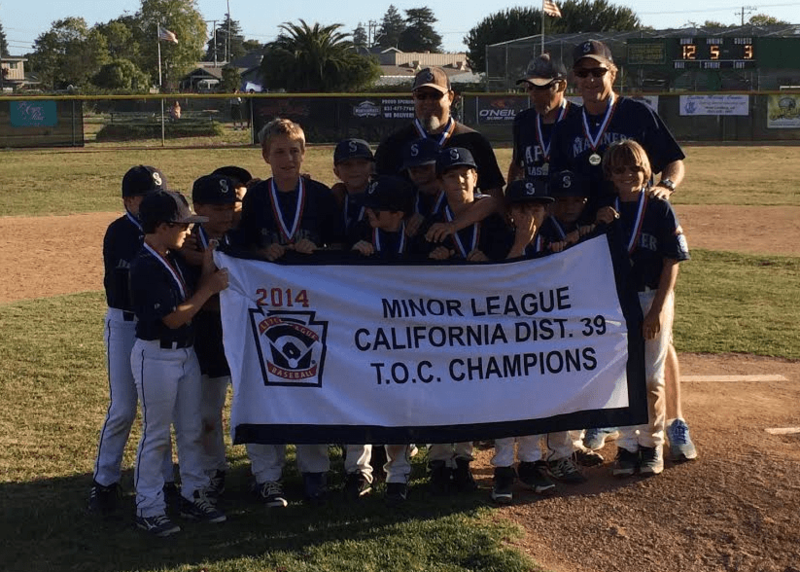 Then you should know that the Aptos Little League has opened registration for Fall Baseball. Registration is open to players ages 9-12 (age as of April 30, 2015). The fee to register is $90 and includes a cap and jersey. Little League is an incredible opportunity for your kids to learn teamwork, get some exercise, make friends, and gain an appreciation for America’s pastime! The focus is on having fun, and no score is kept. Two games are held per week, plus additional practice. Games begin the week after Labor Day and end around Halloween. The deadline for registration is August 22, and time flies by – so if you’re interested in having your children enroll, head on over to the Aptos Little League web site and register today! I make no bones about it: I’m a morning person. All my life, so far as I can remember, I’m up once I see the light, and it’s almost impossible for me to get back to sleep. As I get older, I seem to need less sleep than before, and I get up earlier and earlier. This morning, my son Evan also was up pretty early, and rather than have him fuss and make noise and possibly wake up the whole house (none of whom share my penchant for early mornings), I put Evan in the baby backpack and hit the streets. I needed to visit the Wells Fargo down at State Park and Soquel to make some deposits and get some cash for the World’s Biggest Garage Sale today, and it seemed like the perfect opportunity to do that and get some exercise and fresh air while I was at it. After we hit the bank, I noticed that the Pacific Coffee Roasting company was open, so Evan and I cruised over for a non-fat latte for me and an Odwalla blueberry smoothie-thing for him. Evan started missing his mommy around this time, so he got back in the backpack and we headed back home down Soquel Drive. I love the mornings for how cool and quiet they are. It’s nice to walk down Soquel Drive without the roar of the passing traffic. There were a few people out this morning, going for walks like Evan and I, and it was lovely to say hi, hello, good morning, share a smile, and hear Evan say “hi” too in his little baby voice. Almost back home, we came across a fireman raising the flags at the Aptos Fire Station. It was pretty cool to watch him tend to one of his daily duties in the calm and still of the morning. Don’t know why, it just was.